Total War: Attila’s upcoming expansion shines a light on a leader who could not be more different from the ruler of the Huns. Age of Charlemagne focuses on the man that would lay the foundations for the Europe we know today, uniting much of the continent under the Holy Roman Empire. With this expansion, Attila moves further away from antiquity, starting in 768AD, letting would-be leaders carve out their own slice of the medieval world. Attila’s grand campaign was one of constant conflict and motion, full of migrating tribes, the clashing of cultures and the burning of cities. Things are a bit different in Age of Charlemagne. Europe’s been exhausted by war, and surprisingly, this means that going to war should be a last option, with the goal being to finish the war quickly to stop the morale of the kingdom dropping due to war weariness. A change in tone and period also means lots of new features. New playable factions will be announced soon, along with unique story events and objectives that will lead to the founding of new kingdoms. And within them, you’ll be able to explore new technologies and raise armies full of new units. It looks like we can expect a lot of changes, then, including an aesthetic overhaul for the UI, complete with medieval manuscripts and lots of lovely stained glass, and new, more specialised agents. 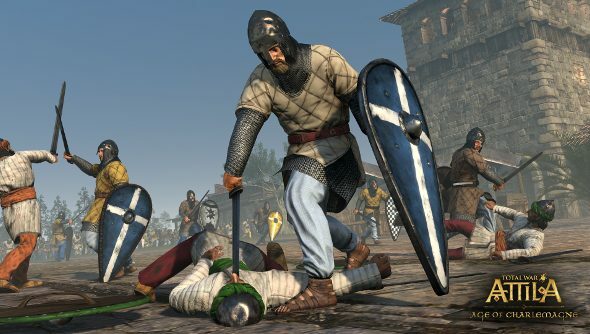 As a big fan of Attila (I reckon it’s the best of the entire Total War series, except for maybe Shogun 2), I’m very interested to see what the shift from nomadic tribes and dying empires to forging brand new kingdoms will bring. Age of Charlemagne is due out on December 10th on Steam.